Reference number for this case: 15-Aug-54-Tarbes. Thank you for including this reference number in any correspondence with me regarding this case. Returning by car from Pau to Tarbes in the night from the 14th to the 15th August 1954 and driving, my eyes were attracted by a sharp gleam in the South, above the Pyrenees mountain range: after a split second of hesitation where I believed it was fireworks, I recognized a fireball moving from up to down following an appreciably vertical trajectory. The apparent diameter was about equal to the quarter of the diameter of the Moon, and it was followed of a trail of 2° to 3° giving the impression of a flame; its color was an intense emerald green; whiter showers of sparks escaped from the head and the trail. The trajectory was of approximately 15° and seemed me to last a little more than 2 seconds. The bolide disappeared suddenly at 15° above the horizon without bursting and without any noise being perceptible. It was exactly midnight 12 minutes, standard time. The display was at the same time impressive and splendid. 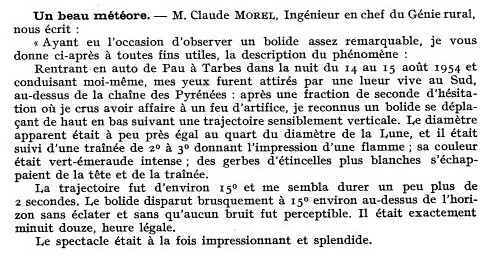 The author indicates that on August 14, 1954 at night at 24:12, C. Morel, chief engineer of the agricultural engineering is in a car goinf from Pau to Tarbes and sees a sharp gleam in the south above the Pyrenees, a bolide moving from top to bottom appreciably to the vertical, of an apparent diameter of a quarter of that of the moon, followed of a trail from 2 to 3 degrees giving the impression of a flame of intense emerald green color, with "whiter shower of sparks of the head and the trail", following a "trajectory of 15° approximately", for more than two seconds, "the bolide disappeared suddenly above the horizon without bursting and without noise. It was "difficult to follow the meteor: about in the median plane of the segment of line Pau-Tarbes and at the south of this line". The sky was cloudy and there were clouds masking the Pyrenees. The source is indicated as "BSAF, 1954 p 354". Obvious observation of a meteor. [as1] Meteor report, in L'Astronomie, magazine of the Société Astronomique de France, Vol. 68, page 353, September 1954. 1.0 Patrick Gross February 14, 2010 First published, [jc1]. 1.2 Patrick Gross October 26, 2011 Addition [as1]. Change of date, from the 14th to the 15th, as [as1] gives 00:12 in the night of 14th-15th. This page was last updated on October 26, 2011.